Entire contents are copyright © 2018 by Kathi E. B. Ellis. All rights reserved. The penultimate offering of the 2018 Kentucky Shakespeare Festival season is the Louisville Ballet’s third Shakespeare adaptation. This year the team of choreographer Roger Creel and composer Scott Moore take on The Tempest, widely acknowledged as being one of a cluster of Shakespeare’s final plays. 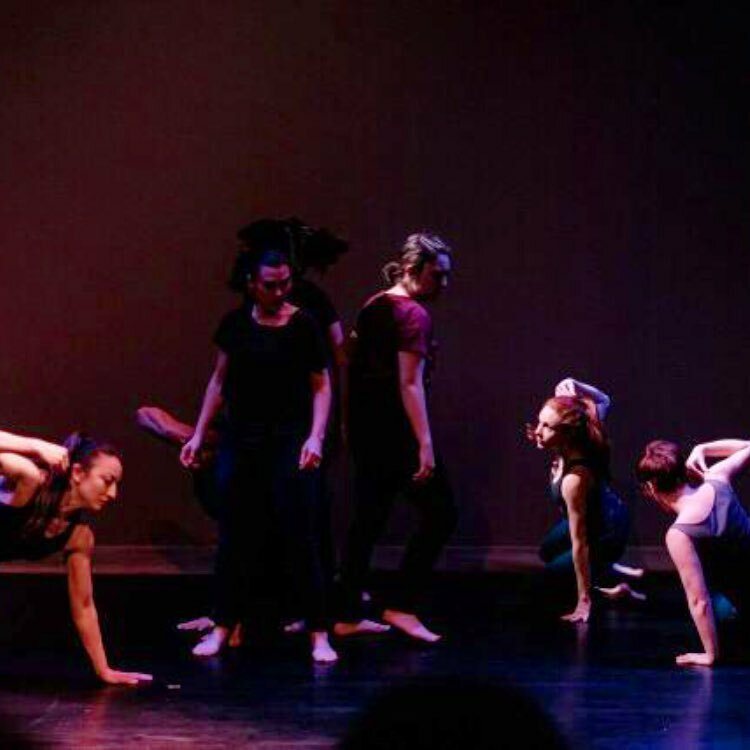 As with previous adaptations, Creel diverts from the original script when necessary as a means to showcase the storytelling through dance. Many of Shakespeare’s complex verbal feats are not suited to direct translation into other mediums. In this case, Creel makes the choice to begin the ballet embodying the backstory which takes Prospero a long Act I scene 2 to reveal. The upside to this is that we have the opportunity to view Prospero (Robert Curran) ignoring his political duties as Duke of Milan – which leads to his usurpation – and then how he and Miranda (Shelby Shenkman, Maya O’Dell as young Miranda) spend time together on the island as she grows up. This allows the audience to develop a relationship with these two central characters before they became embroiled in the action of the actual story. With Lady Lear last year, Creel excised some plot lines. Maybe because The Tempest is shorter than King Lear, this year he chose to keep in all of the subplots. While Stephano (Clare Harper), Trinculo (Aubrielle Whitis), and Caliban (Brian Grant) definitely provided some comic relief, they, together with the court (Alonsa (Emily Reinking O’Dell), Gonzala (Emma Rose Atwood), Antonio (Sanjay Saverimuttu), and Sebastiana (Ashley Thursby),) appeared much less central to this telling than in the original. This opens up the question as to whether this Tempest could survive by focusing on Prospero, Miranda, Ferdinand (Rob Morrow), Caliban, and Ariel (Trevor Williams.) Almost creating a Tempest suite. 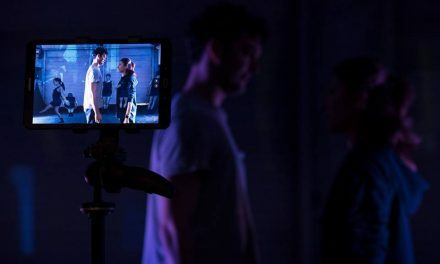 An analogy would be in this year’s Louisville Fringe Festival, the futuristic adaptation Robothello wisely focused on a narrow plot line and by doing so achieved success. The incorporation of Step dancing (choreographers Chris Malone and Antae Dickerson) to embody the island sprites* who created the storms was largely successful. 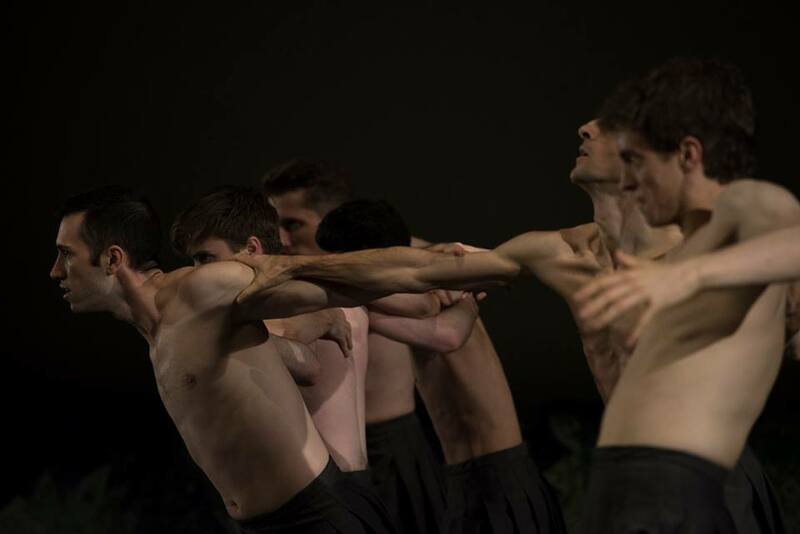 The energy and vitality that the nine dancers brought to the stage was palpable. The intense patterning of this form of dance is impressive, and was remarkably executed. The two sequences that were most compelling for me were: first the one in which they and Ariel were clearly connected in the creation of the storm, blending Step, modern dance, and gymnastic moves; and later in the play when Prospero conjured the island’s magic through the sprites, with the rhythms starting almost seductively slowly until the whole island was pulsing with the energy needed to conduct his spell. The Prospero-Ariel dynamic was equally compelling. 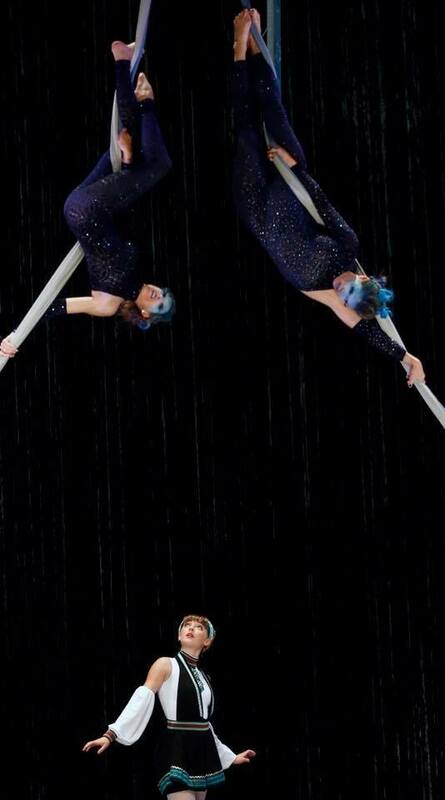 Creel created some fascinating lifts which both signaled the master-servant relationship and subtly created the illusion of Ariel’s aerial-ness, specifically the signature leap for Williams to perch on Curran’s shoulder. Williams, one of the Louisville Ballet’s trainees in this production, is showcased in the role of Ariel. 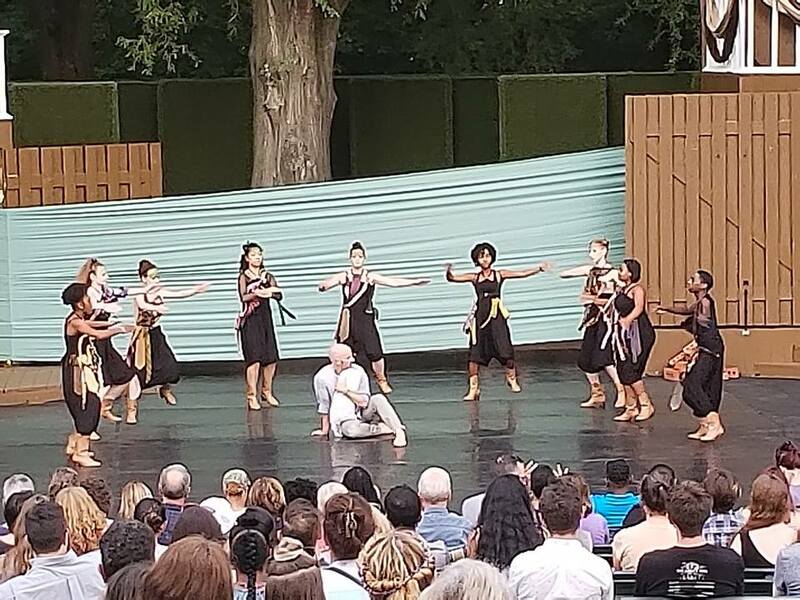 He handles the brisk, pizzicato choreography with confidence and aplomb, his Act II solo bringing enthusiastic applause on opening night and a no-hands cartwheel/tumble elicited an audible gasp in the park. Curran’s Prospero is both self-effacing and all-powerful. In the opening seconds of Tempest, he steps quietly onto one of the raised stages and merely stands there; almost immediately the spread-out, chatty audience in the park became aware of this silent presence as focus swiveled to him, before a note of music is heard. The balustrade surrounding these upper platforms meant that some of his footwork was obscured during his initial solo. Once on the island, the relationship with the baby Miranda, and subsequently with O’Dell and Shenkman, was charming. The years’ passing was deftly handled, and choreographic echoes established the growing love and inter-dependence of father and daughter. Prospero’s final solo as he wrestles with giving up his “rough magic” was heartbreaking. Especially juxtaposed with the painful rapprochement between him and Alonsa, with some beautifully-crafted moments of tension and awkwardness between them. The love interest between Miranda and the stranded Ferdinand was also charming. Shenkman captured a sense of the liveliness of Miranda, unbound by societal expectations, together with the newness of discovering a man unlike father or Caliban. It was good to see Morrow in a more dramatic and lyrical role than is his norm as Ferdinand. My one query about Ferdinand came in a late quartet when choreographically it appeared as if Ferdinand could now see Ariel, when earlier it had been well-established that humans other than Prospero were oblivious of the sprite. The scenes with the court characters were the least successful for me. The strident, angular movement and music was overwhelming; I felt like the choreography neither explicated the text nor established the interrelationships effectively, with the exception of Antonio and Sebastian’s plot to kill Alonsa which is thwarted by Ariel. Staying close to the action of the original, this sequence was recognizable to those who know the play and absolutely clear for those who don’t. An awkward translation from script to ballet is in the conjured banquet for the “three men of sin.” The presence of a very real table and three chairs that had to schlepped on and off stage by Ariel and Caliban together was a too literal adaptation. The island sprites have already demonstrated their strength, we’re ready to suspend our disbelief and accept Ariel’s flying ability; could not the Steppers have created this abstractly, so that Ariel did not have to liaise with Caliban and descend to being earthbound. The trio of Stephano, Trinculo, and Caliban, stayed true to the original dynamics of the script. My discomfort with this storyline lies in the two roles that were played by young women; even if the intent was androgynous characterizations, both choreography and costuming suggested femininity. In a #MeToo world, two young women getting plastered and hanging out with a guy who’s already approached another young woman inappropriately, has a completely different subtext and resonance than exists in Shakespeare’s creation. A perennial omission in non-main stage ballet programs is the absence of credit for the designers. And in this case set and costuming, in particular, were substantial. The tie-dyed costumes of the island sprites were punkishly anarchic as promised – with the disappointing exception of the uniformity of the boots. Color ranges helped establish rank and relationship. The inner gold chamber was a mystery – half of it was covered by the green swathe of fabric that was designed to ground us in the island – and the other half opened up for seconds to reveal Ferdinand and Miranda who, with no chess game, spent no time in the opulence. Moore’s score was most successful with the island’s denizens, bringing a wide range of bluesy jazz references into play, and with the complex rhythms of the Step sequences. The ensemble (he, John Moore, Charlie Patton, Dan Dorff) played live on stage, which is always a thrill. On opening night there was some cluttering of instruments against wooden stage and walls as they swapped out instruments between numbers, which added to the sense that the musical pieces were tracks on a thematically-connected album, rather than a fully-integrated musical score of Tempest. After three years of world premiere balletic Shakespeare adaptations, the productions are beginning to feel like staples of both the Kentucky Shakespeare and Louisville Ballet seasons. With Creel’s departure from the ballet, we can hope that this significant collaboration can find a way forward. Another company choreographer? Creel returning as guest artist? What are the options? Here’s a shout out to both companies to announce what summer 2019 promises as soon as possible. *Island sprites: Darnisha Brooks, Dayera Burton, Nevaeh Goldsmith, JonMarie Johnson, Raquel Jones, Addison Mathes, Ellie Prince, Jaylan Roberson, Emma Rose Strybel. Kathi E.B. Ellis is an associate member of the Stage Directors and Choreographers Society and a member of Lincoln Center and DirectorsLabChicago. She has attended the La MaMa Directing Symposium in Umbria, Italy and is featured in Southern Artistry, an online registry of outstanding southern artists. Her directing work has been recognized with nominations for South Florida theatre’s Carbonell Award. Locally, Kathi is a member of Looking for Lilith Theatre Company, a founding principal of StageLab theatre training studio, and part of ShoeString Productions, an informal producing collective. 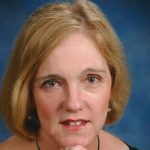 She has written book reviews and articles for Southern Theatre, the quarterly publication of the Southeastern Theatre Conference, and was a contributing writer for JCPS’ textbook for the 11th grade Arts and Humanities survey course and for YouthArts Tapestry, a Kentucky Arts Council publication.